On Saturday I went with my family to Bread & Wine on Moreson estate for lunch. What an amazing lunch it was. I have been eager to try Bread and Wine because I have heard great reviews and it was also voted in the SA top ten by Eat Out magazine. The weather on Saturday was absolutely perfect. Sunny days in winter are lovely because they are not too hot. There were six of us, which gave me an opportunity to taste quite a few of the dishes. There is quite a lot of space indoors, but on such a fine day most people chose to dine al fresco. The environment is absolutely beautiful in the courtyard with rows of lemon trees to the one side and other trees dotted around the courtyard itself. I popped into the winetasting area to check out the wines before lunch and was very impressed. Moreson makes some top quality wines. All their wines are on the wine list at cellar prices, which is refreshing. Their premium wines are not cheap (R80 to R100), but they are excellent and in restaurants you seldom get quality without the ubiquitous 100% to 200% markup. We enjoyed the Rosé made from Pinotage grapes and then tried the Cabernet Sauvignon/Merlot Blend from the value range (R45). The food was amazing. We started with the Antipasto Plate (R80 – follow link below to the gallery for a picture of the plate) between us. The selection of meats (made on site and stocked in the charcuterie/deli) was varied and each one was tasty and unique. The platter was a little taste extravaganza to warm up our tastebuds. For mains, I had the fish which was too underdone. When I complained, the waiter apologised and returned with a fresh plate of food 5 mins later. This time the fish was excellent and the saffron mash was an interesting accompaniment. My father had the Cassoulet (a type of bean stew), which was absolutely fabulous. The strips of duck and homemade pork sausage added so much flavour to the dish. The Poached Trout (R85) was lovely and the Lamb Rump (R90) was superb. The Porcini Dusted Kudu with smoked beetroot custard (R90) was also top notch. Everyone was so pleased with their meal, it would be appropriate to say they were genuinely excited about their food. For dessert we basically ordered one of everything and were hard pressed not to order another round because they were so good. The freshly baked Apple and Berry Crumble (R30) nearly caused a rift in the family. The Plate of Sweets (R30) didn’t last long and neither did the Steamed Chocolate Pudding (R30) or any of the others, for that matter. The total bill was about R150 per head and worth every cent. Truly one of my best lunches. 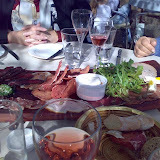 We perused the charcuterie afterwards and were treated to some tastes of the meat selection. Needless to say, we left with our hands full of treats for the dining table at home. I ate at Bread & Wine again today. There were 2 of us and between us we shared the antipasto platter (R95), the cheese platter (R55) and the warm salad (R55) with prawns, leeks and enddives. This little taste extravaganza was accompanied by homemade bread and a couple of glasses of the Pinehurst Cab/Merlot blend (R15) which was very drinkable. The standards have not dropped, Bread & Wine is still a destination, particularly for summer. I have been eating at Bread and Wine since the late 90’s when Neil Jewell and his wife, Tina, first arrived on the scene. It was obvious from the very beginning that this was going to be somewhere special and it has been fascinating to see it develop. Like all the top modern restaurants, the cuisine depends upon top class ingredients, usually from local sources. They are combined in deceptively simple ways, but don’t under-estimate the skill, innovation and attention which goes into producing the finished result. Neil Jewell is very un-assuming guy and I think his success is not just based on his culinary skills, but on the way he manages his staff and gets the best out of them, and also on the way he relates to his suppliers. I fully endorse all the good things which have been said in Dax’s review. For me, Bread and Wine is the best place to eat in South Africa. Thanks Graham, it’s nice to hear when people treat their staff well. Financial, verbal and sometimes physical abuse of staff seems to be a legacy which SA is struggling to shake off. I refuse to support restaurants that abuse their staff and I hope that readers of this website will report such incidents via comments on the relevant post. I’m curious about your PS which didn’t make an appearance, what am I missing out on?